Shell & tube type Heat Exchangers are built in a wide variety of sizes and capacities. The Heat Exchangers are fabricated as per TEMA / ASME unfired pressure vessels codes & ASHRAE standard. 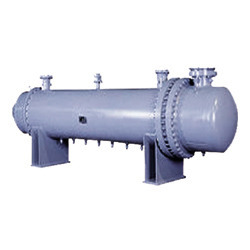 Heat Exchangers for sea water marine application or with steels shells are also offered and designed as also offered and designed as per customer specific requirement.